Let me start off by saying that I am a fan of Cedric’s physique. I consider him to be one one of the greatest of this decade; however, I don’t share in the same marvel of others, like Arnold, over his physique. 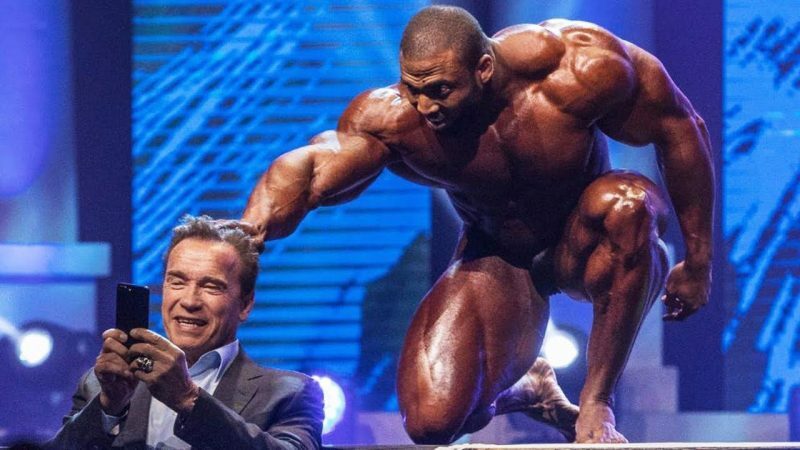 Arnold made a point to make public comments about how great he thought Cedric was in 2016 and was ecstatic when he won in 2017. There’s no question that McMillan has a physique that appealed to many of Arnold’s generation. Under the guidance of Chris “The Technician” Aceto, he’s been able to earn top placings at a number of contests. As already stated, he was also able to win the Arnold Classic. That’s normally a very significant title and it’s a victory which usually serves as a launching pad for big things later in the year at the Mr. Olympia – the most coveted title in bodybuilding, worldwide. Further, Cedric has had some historic battles that also make a strong case for his ability to battle on stage, even against all the odds. A great many competitors have never pushed themselves to the limit, and that fact means they’re not great champions. I want that one point to be crystal clear – I consider Cedric a consummate professional, a great pro bodybuilder, and a competitor who will go down in history as a real warrior. Now, with regards to the upcoming Arnold Classic and the 2019 Mr. Olympia, I don’t think Cedric will do well, at the rumored 290lbs he’s gunning for. I also feel like his best days may be behind him. The world of bodybuilding is an ever-changing sport, now more so than ever, especially with the crowning of a new Mr. Olympia in 2018. For me, it’s quite difficult to understand how an Arnold Classic champion goes on to barely crack the Top 10 at the Mr. Olympia later that year. In 2017, Cedric faced a strong challenge from the late Dallas McCarver, but beyond that, he didn’t really face any substantial opposition at the Arnold. The fact alone is unbelievable, considering the purse the Arnold pays and the respect that that title carries. Considering that Cedric and Dallas were the two best bodybuilders on the stage, didn’t make much of a case either, as neither of the two were at their best. If the Top 2 were lackluster, then one can only assume the rest of the lineup looked pretty awful. Truthfully, that win in Columbus was almost like a present. That’s not to say Cedric couldn’t win among the best, but on that day, two things happened. The first thing that happened was that Cedric won a very important title with very little competition. The second thing that happened, is that I believe it gave him far more self-confidence than it should have. Perhaps in his mind, he may have figured that if the look he brought to Columbus was enough to win the sport’s second biggest title, that maybe it would do the trick for the biggest title of all. I saw very little difference between Columbus and Vegas, despite the fact that the shows are almost seven months apart. That 2017 Olympia was embarrassing for McMillan. Cedric is a fighter and has brought great condition to the stage, many times over. When he’s on, it’s showtime. When I look back to 2016 and the degree to which Cedric pushed Kai Greene, at his best, might I add, it makes a very strong case for McMillan’s abilities. Kai Greene is without a doubt one of the freakiest bodybuilders of the last 10+ years, his condition is spot on, and his posing abilities are off the charts. Anyone who knows anything about bodybuilding, not to mention basic facial demeanor, could tell that Cedric was on Kai’s radar. The more the contest went on, the more uncomfortable McMillan was making Greene. You could definitely tell, Cedric was in The Predator’s head. That version of McMillan could have done major damage at any competition – including the Mr. Olympia. Had Cedric brought his 2016 Arnold look to the 2017 Mr. Olympia, it might have been him standing next to Phil, waiting to hear the results from Bob Cicherillo. There’s only so much credence that can be given to rumors. The internet is full of them, particular on message boards. The word on cyber street, is that Cedric will get on stage in the 290’s, but we’ve all seen what happens when an aesthetically pleasing bodybuilder plays the size game. They often times lose their lines, blow out their symmetry, and change their whole presence on stage. Whether it’s because they’re weighed down or because stress has gotten the best of them, most guys who play the mass game, even seem to pose differently. It’s quite a gamble, but if these rumors are true, this may be one of Cedric’s last attempts to reinvent himself. In terms of coaching, Chris Aceto has always seemed to be a bigger McMillan acolyte than a Rhoden one, but when Rhoden is the recipient of the biggest title in bodybuilding, The Technician would be The Fool if he turned his back on Flexatron. The reality of the matter is, Chris’ focus should be entirely on Rhoden. That is.., if Rhoden is to successfully defend his title. I don’t believe a coach coaches everyone the same and/or gives everyone the attention they need, when they need it – that sounds almost utopic. The truth of the matter is, there’s higher priority clients and a pecking order – whether consciously or subconsciously – I believe it’s there – with all coaches. McMillan, may not be feeling the love, and this may be his last attempt to win a second Arnold. As great as he was in 2014 and 2015, I would be shocked if Cedric pulled a win – or even a Top 3 – with the lineup that he’ll be facing up against in Columbus in about 8 weeks. That’s no knock on him as a person. He’s a super nice guy, who brings a lot of heart, but the sport of bodybuilding is constantly changing, constantly getting more and more competitive. Guys want the money and the respect, especially because there’s no more magazine contracts and there’s far fewer supplement companies signing athletes to high five-figure and low six-figure contracts. One of the most unavoidable aspects of the fallout of the changing of the guard at the 2018 Olympia, is the fact that every man has set his sights on Shawn “Flexatron” Rhoden. It is very much unlike other years, because no one ever thought that 7x Mr. Olympia Phil Heath could ever be defeated. Most guys were starting to regard Phil in the same way competitors regarded Ronnie. I still remember when Jay Cutler would say he could beat The Big Nasty – most of his contemporaries were incredulous, they thought there was a greater chance that pigs would fly and their facial demeanor and body language supported these theories. Now, with Flexatron there, with only one win to his name, every guy wants a crack – from the rookies to the superstars on the verge of retirement. Hell, some of the guys from yesteryear might even give it a try, especially since Phil Heath has asserted he won’t do the Olympia in 2019 and it’s looking highly unlikely that Kai Greene will, either. Shawn Rhoden is no pushover, but he’s new, and new champions get challenged far more so than multi-year, reigning ones. I’m sure there will be some crazy battles at the Top 3 in both Columbus and Las Vegas, later this year, but I highly doubt that a Cedric in the 290’s will be there; however, a ripped to shreds McMillan, posing like the legend he is, may very well be in the mix. Cedric from the 2016 Arnold could win in Columbus and have a very strong shot in Vegas – no doubt about it. In closing, I hope my message is a clear one: Cedric, please don’t play the mass game. I hope you enjoyed my article, here at Iron Magazine. I look forward to reading your comments, whether here or wherever you see this article. Next Next post: Is Tad Inoue The Next Joe Rogan?